The Shang Dynasty ruled over northeastern China, in the Yellow River valley, from 1600 BC 1046 BC. Though these are still approximate dates, a sufficient number of archaeological findings (bronzes, oracle bones, tortoise shells) speak of the development of this dynasty founded by the commander Shang Tang who defeated Mingtiao, the last ruler of the Xia Dynasty (2070-1600 BC.). The Shang dynasty had developed a complex system of writing, were skillful in bronze casting, and the production of pottery vessels was fairly widespread. The population was engaged in mining, transportation and refining of copper, tin and lead. Moreover, at this time there is the development of jade objects for religious rites, and of silk. Development of mining and casting of metals have produced new unknown to that era disease as metal poisonings. 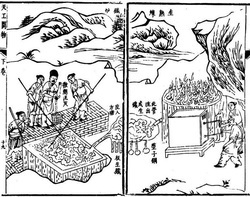 Increase of cases in metal and gas poisoning made ancient Chinese to think about development of medical procedures to treat these conditions. They realized, that heavy metals as led and mercury moves through arteries to capillaries as arterioles to move into venules, larger veins and become eliminated through the liver. Unfortunately in the place with lowest blood speed as venules and arterioles these heavy toxins settle in tissues between capillaries. It was a time when Chinese ancestors developed one of most powerful detoxification methods without intake of any medicines and used now in our clinic together with acupuncture and massage treatment . Treatment produces increase of circulation in tissues surrounding capillaries without intake of any medicines. Our circulatory system only 25% filled with blood, making some places to have only occasional blood flow. Activation of circulation make heavy metals as led or mercury become expelled through the skin in form of their salts, nonmetallic toxins as medicine residues rush through the vessels to become expelled through liver or kidneys. At the photo on the left you may see visible dark line of led's salts expelled through the skin of forearm. Of course not many patients see these visible signs of exposure to toxins, but all of us have contact with toxins and metals during our dally life. Earth atmosphere, as example, has 12000 tons of evaporated mercury. 910000 tons of mercury are produced every year mostly by power stations burning coal, half of this amount goes directly into the water and become absorbed by fish and other fresh and salt water creatures. We inhale led daily as product of motor-vehicles activities. Use of lipsticks, makeups and other beauty products make people become exposed to led, excess of aluminium and other metals, affecting all our body functions. Shang Tang Wan detox produces immediate improvement of metabolism as liver and kidney functioning, improves reaction of nervous system, improves vision, hearing, immunity, patients feel increase of energy, weight loss; it may increase an urination, urine may become green colour for a short time. There is no special diet required, patients need to take regular shower to remove expelled toxins through their skin.